Following the success of the Sabre 38 and 42 Hard Top Express models, Sabre Yachts is proud to present the new Sabre 34 Hard Top Express. Built in Maine, home to America’s finest yacht builders, this new design also offers the classic look and performance for which Sabre Yachts is so well known. But the Sabre 34 has even more of the elegance and creative details that boat buyers have come to expect from the Sabre Design Team. Her elevated helm deck offers clear sight lines from the Stidd helm chair and the elevated L-settee to port provides ample views for her crew and guests. A convertible back rest at the forward end of the settee creates a comfortable mate’s seat. A fully functional galley is located to starboard aft of the helm seat. 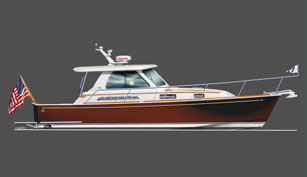 Standard power for the Sabre 34 is a pair of Yanmar 315 HP diesel engines with electronic controls and digital gages. Also available are the Volvo D6 310. Yanmar and Volvo 380 hp engine upgrades are available for those seeking higher cruise and top end speeds. The standard engines will provide a cruise speed in the mid-twenty knot range. A generator and below deck air conditioning system are included as standard equipment. Below deck, this 34 footer is truly unique, designed as an open layout which creates a private owner’s suite. A full, queen-sized berth, low to the cabin sole, is easy to access. To port and aft is a full head with separate shower stall. To starboard is a comfortable L-settee with matching ottoman. This is one of the most comfortable and welcoming spaces ever offered in a production motoryacht. If you have questions on this retired model, please contact Tucker Thompson in Customer Service at: 207-655-3831 or via email.